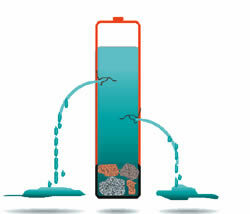 All batteries exhibit a certain amount of self-discharge; the highest is visible on nickel-based batteries. As a rule, a nickel-based battery discharges 10 to 15 percent of its capacity in the first 24 hours after charge, followed by 10 to 15 percent every month thereafter. The self-discharge on the Li-ion battery is lower compared to the nickel-based systems. The Li-ion self-discharges about five percent in the first 24 hours and one to two percent thereafter. Adding the protection circuit increases the self-discharge to ten percent per month. One of the best batteries in terms of self-discharge is the lead acid system; it only self-discharges five percent per month. It should be noted, however, that the lead acid family has also the lowest energy density among current battery systems. This makes the system unsuitable for most hand-held applications. At higher temperatures, the self-discharge on all battery chemistries increases. Typically, the rate doubles with every 10°C (18°F). Large energy losses occur through self-discharge if a battery is left in a hot vehicle. On some older batteries, stored energy may get lost during the course of the day through self-discharge rather than actual use. The self-discharge of a battery increases with age and usage. For example, a NiMH battery is good for 300 to 400 cycles, whereas a NiCd adequately performs over 1000 cycles before high self-discharge affects the performance of the battery. Once a battery exhibits high self-discharge, no remedy is available to reverse the effect. Factors that accelerate self-discharge on nickel-based batteries are damaged separators (induced by excess crystalline formation, allowing the packs to cook while charging), and high cycle count, which promotes swelling in the cell. Figure 6-4: Effects of high load impedance. A battery may gradually self-discharge as a result of high temperature, high cycle count and age. In older batteries, stored energy may be lost during the course of the day through self-discharge rather than actual use. At present, no simple quick-test is available to measure the self-discharge of a battery. A battery analyzer can be used by first reading the initial capacity after full charge, then measuring the capacity again after a rest period of 12 hours. The Cadex 7000 Series performs this task automatically. In the future, quick test methods may be available that are able to measure the self-discharge of a battery within a few seconds. Some portable equipment does not fully utilize the low-end voltage spectrum of a battery. The equipment cuts off before the designated end-of-discharge voltage is reached and some precious battery power remains unused. A high cut-off voltage problem is more widespread than is commonly assumed. For example, a certain brand of mobile phone that is powered with a single-cell Li-ion battery cuts off at 3.3V. The Li-ion can be designed to be used to 3V and lower. With a discharge to 3.3V, only about 70 percent of the expected 100 percent capacity is utilized. Another mobile phone using NiMH and NiCd batteries cuts off at 5.7V. The four-cell nickel-based batteries are designed to discharge to 5V. Figure 6-5: Illustration of equipment with high cut-off voltage. Some portable devices do not utilize all available battery power and leave precious energy behind. When discharging these batteries to their respective end-of-discharge threshold with a battery analyzer after the equipment has cut off, up to 60 percent residual capacity readings can be retrieved. High residual capacity is prevalent with batteries that have elevated internal resistance and are operated at warm ambient temperatures. Digital devices that load the battery with current bursts are more receptive to premature voltage cut-off than analog equipment. A ’high cut-off voltage’ is mostly equipment related. In some cases the problem of premature cut-off is induced by a battery with low voltage. A low table voltage is often caused by a battery pack that contains a cell with an electrical short. Memory also causes a decrease in voltage; however, this is only present in nickel-based systems. In addition, elevated temperature lowers the voltage level on all battery systems. Voltage reduction due to high temperatures is temporary and normalizes once the battery cools down.